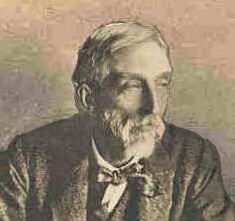 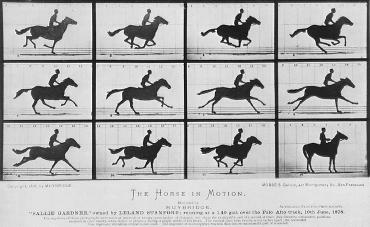 By the mid-1800s, all the conditions for the rapid growth of visualization had been established. 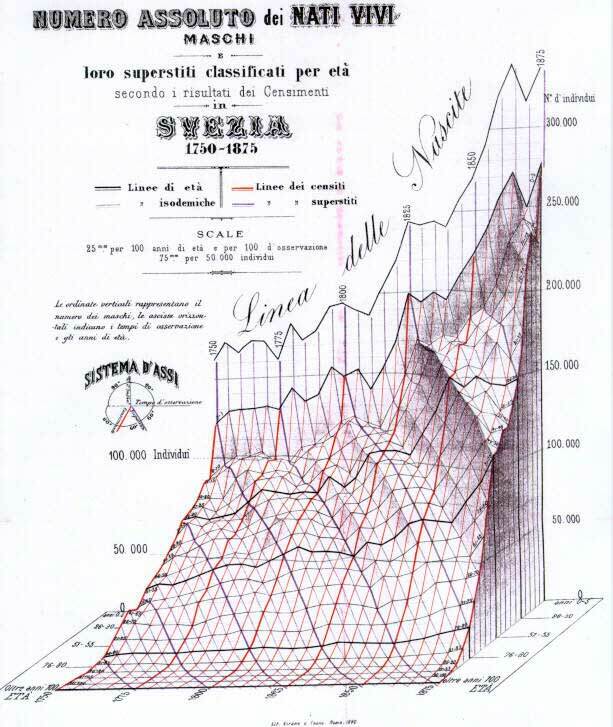 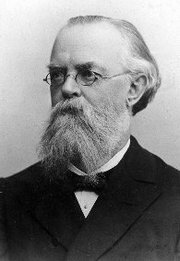 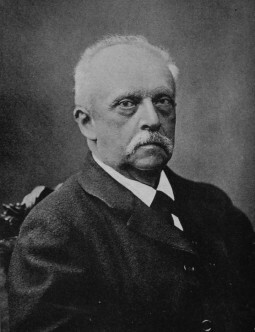 Official state statistical offices were established thoughout Europe, in recognition of the growing importance of numerical information for social planning, industrialization, commerce, and transportation. 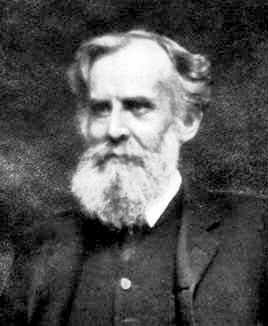 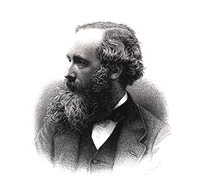 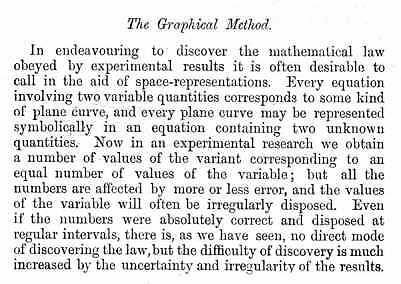 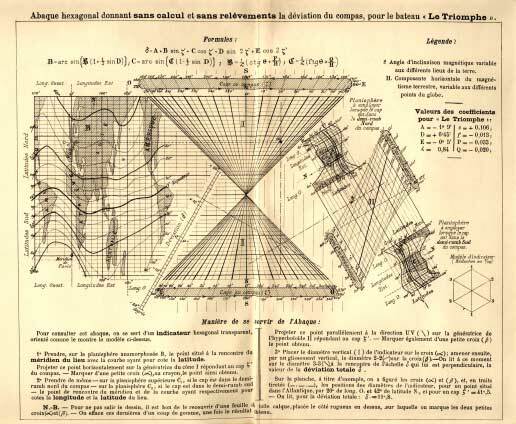 Statistical theory, initiated by Gauss and Laplace, and extended to the social realm by Guerry (Guerry:1833) and Quetelet (Quetelet:1831), provided the means to make sense of large bodies of data. 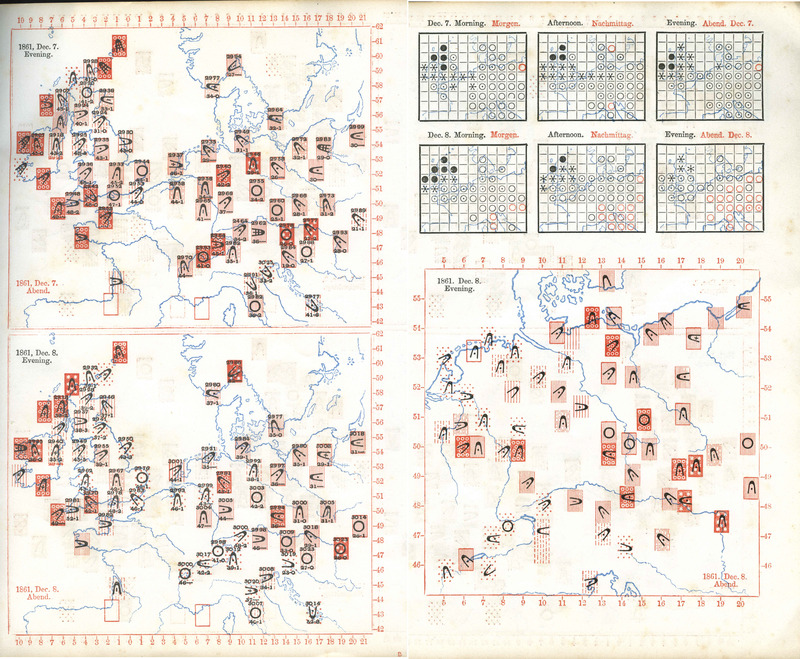 What started as the "Age of Enthusiasm" (Palsky:1996) in graphics and thematic cartography, may also be called the "Golden Age", with unparalleled beauty and many innovations. 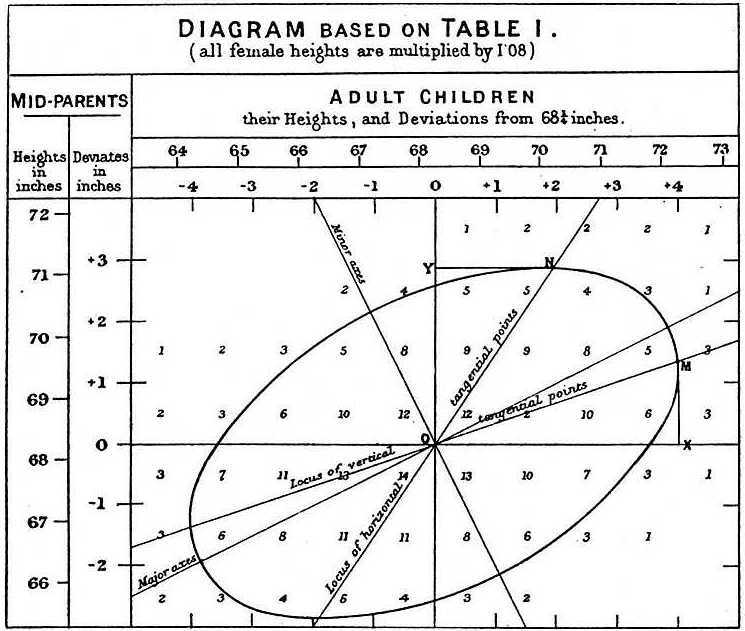 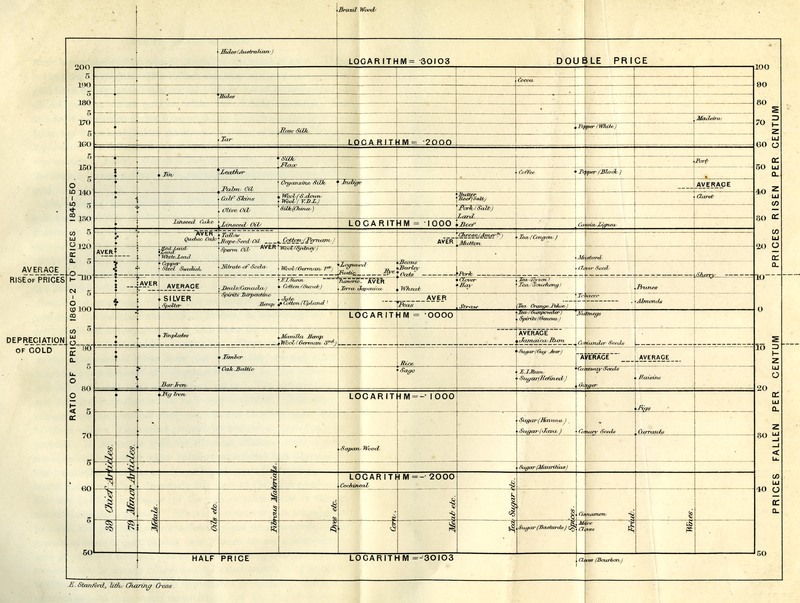 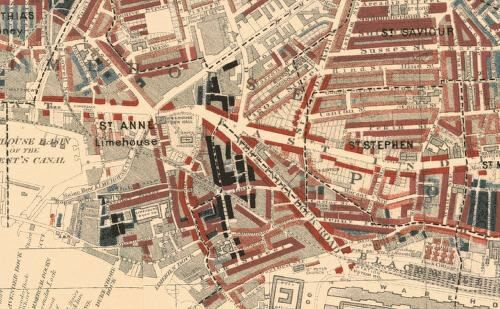 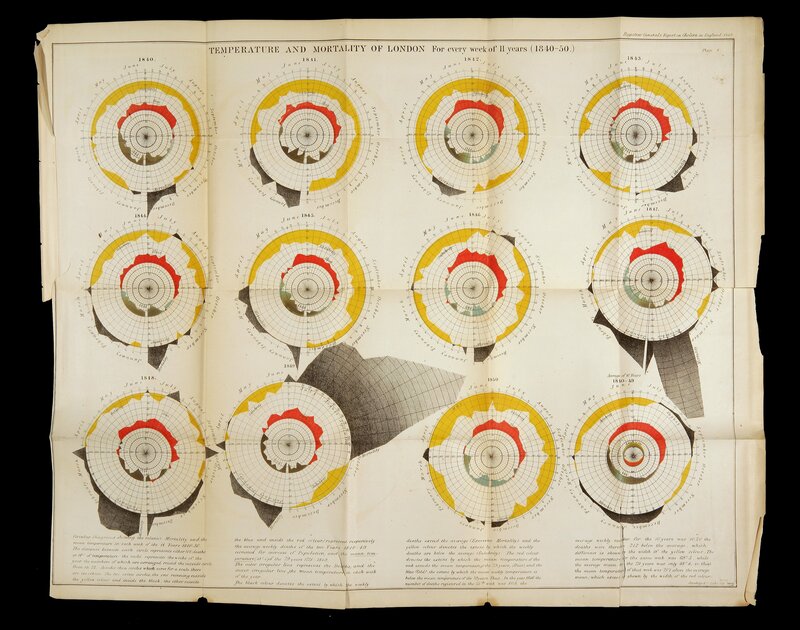 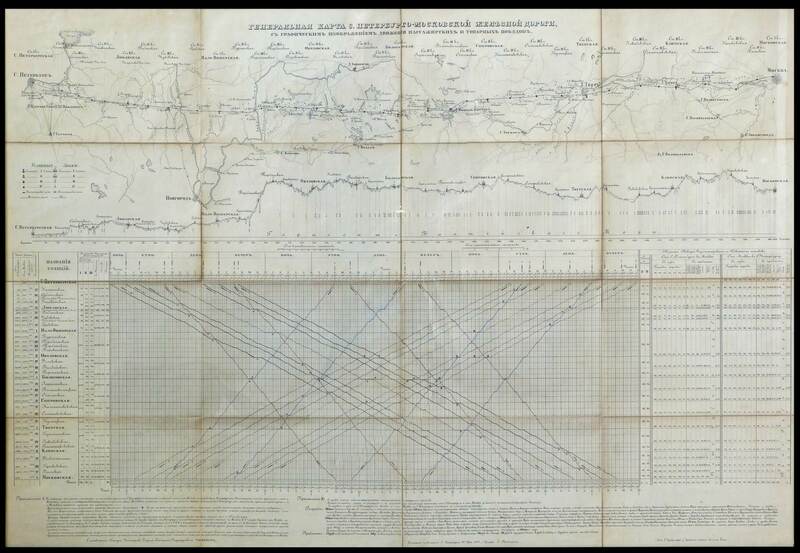 Florence Nightingale is often credited with the invention of this form of a polar area chart, however it is likely that she got the idea from William Farr. 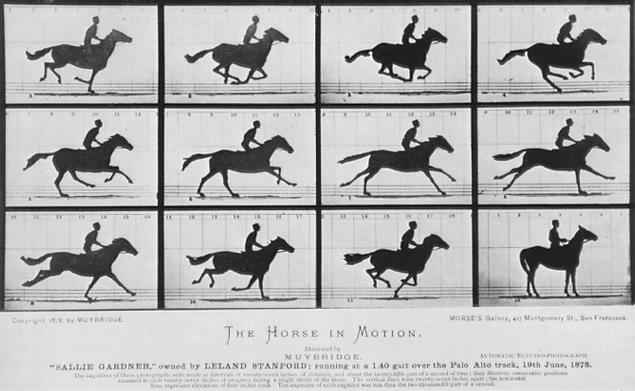 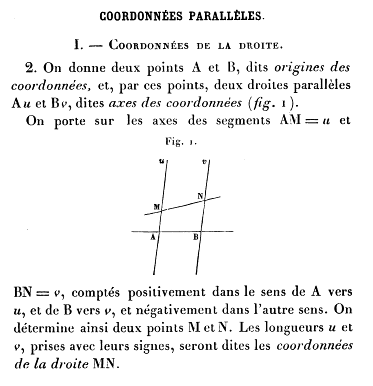 The earliest known use of this graphic form is by Andre-Michel Guerry in 1829. 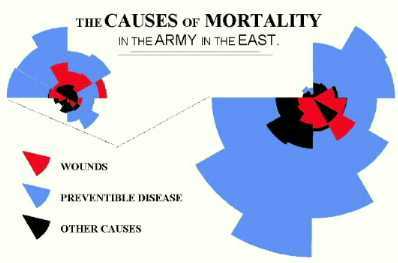 See the link above. 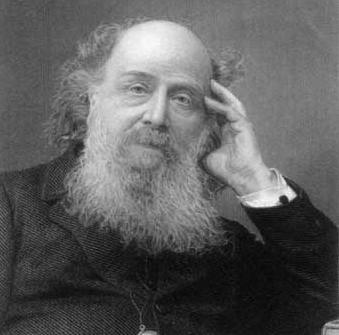 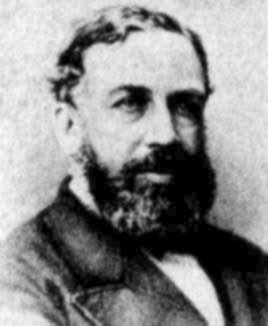 1861, Dec.7. 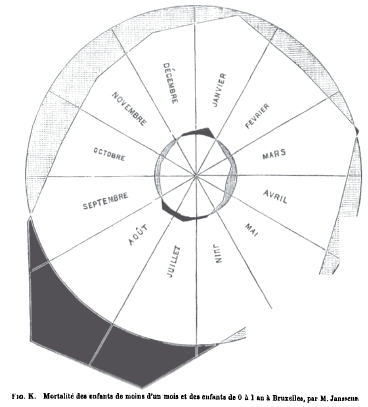 Morning, Afternoon, Evening. 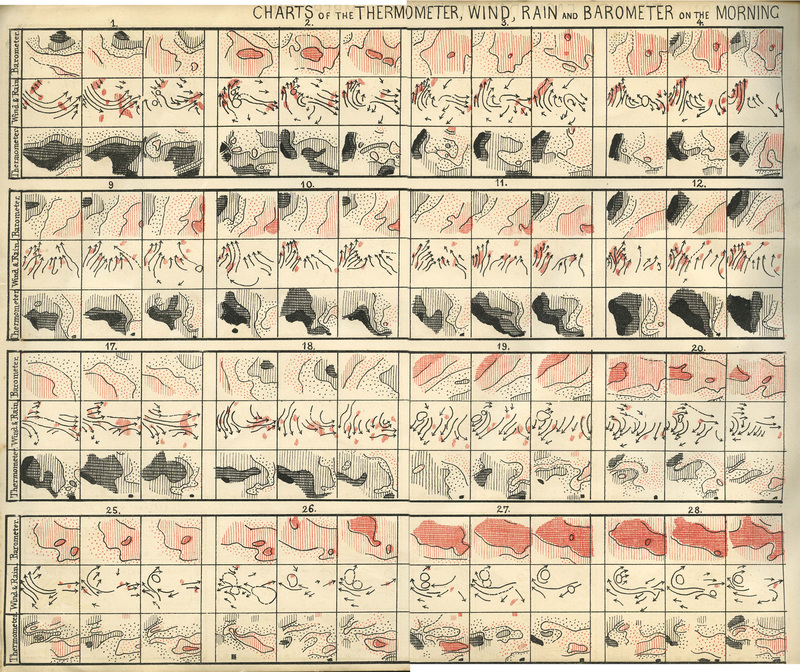 Charts of the temprature, wind, rain and borometer in the morning. 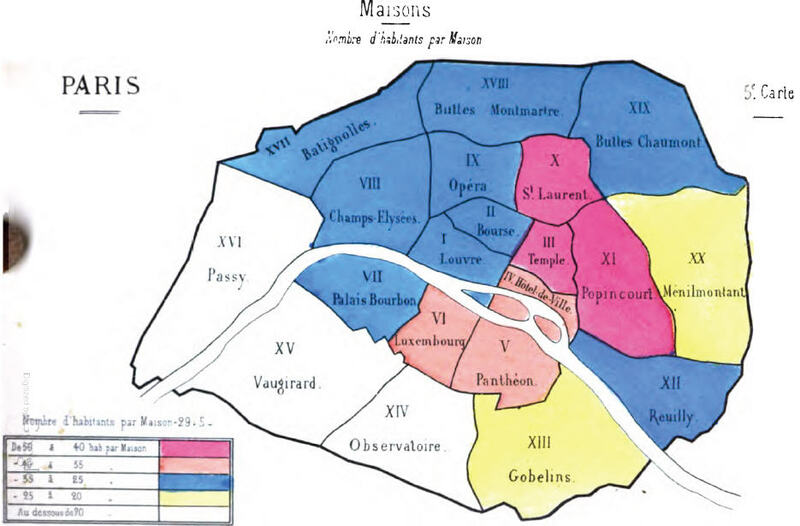 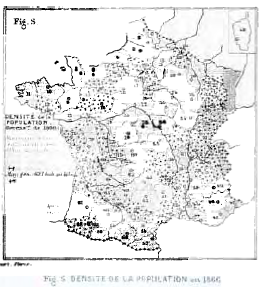 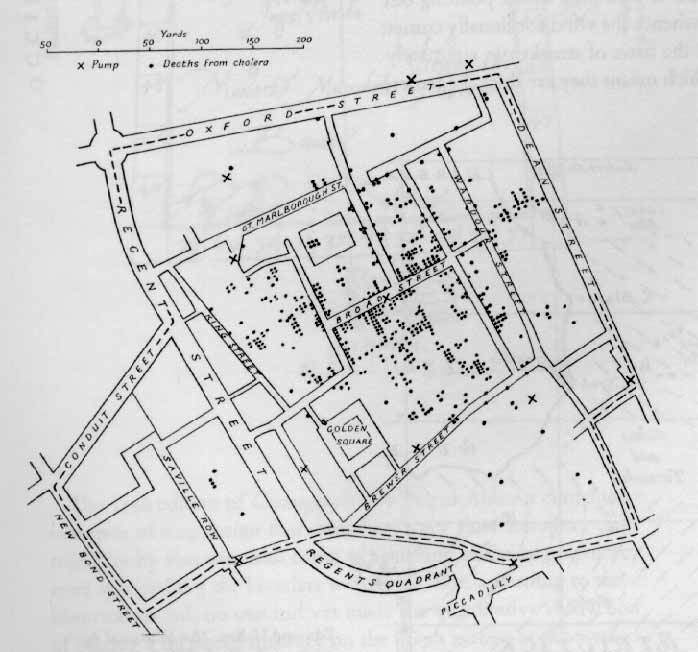 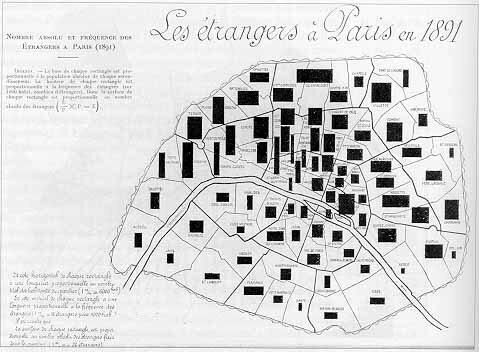 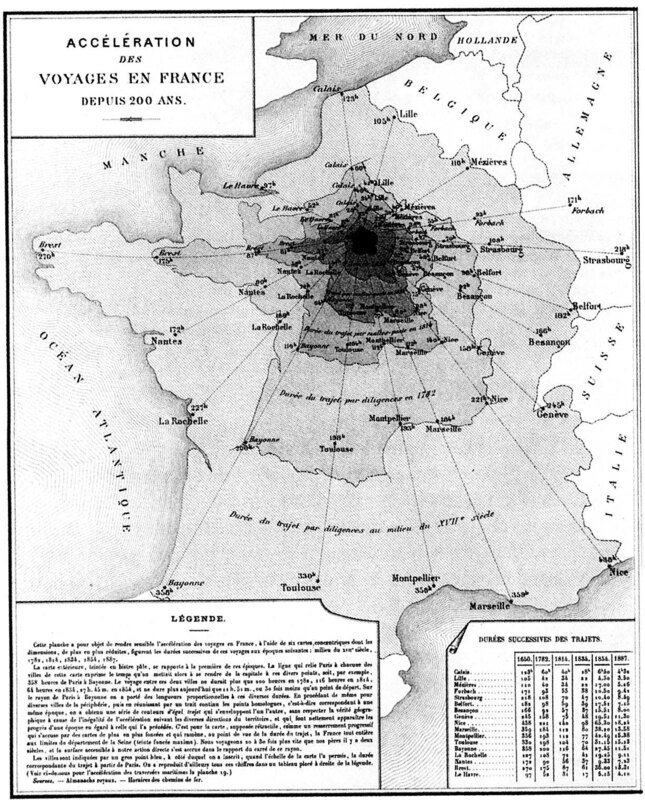 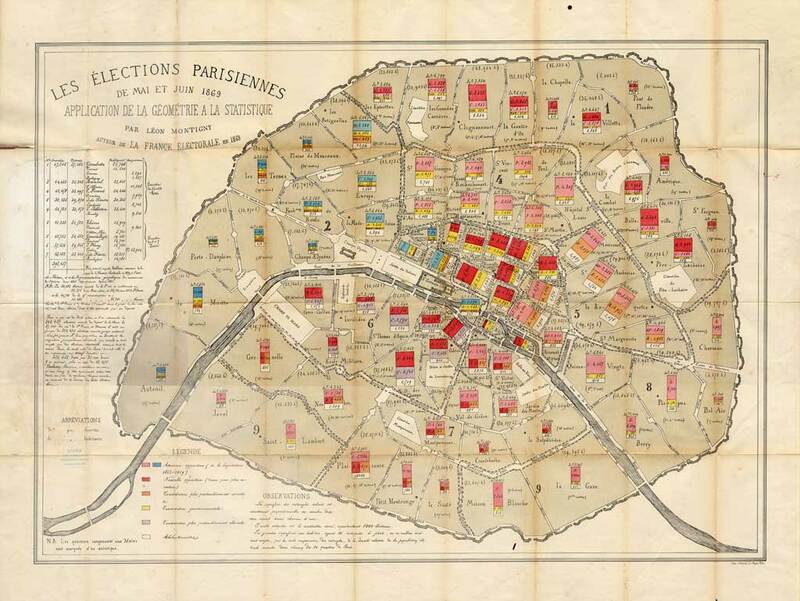 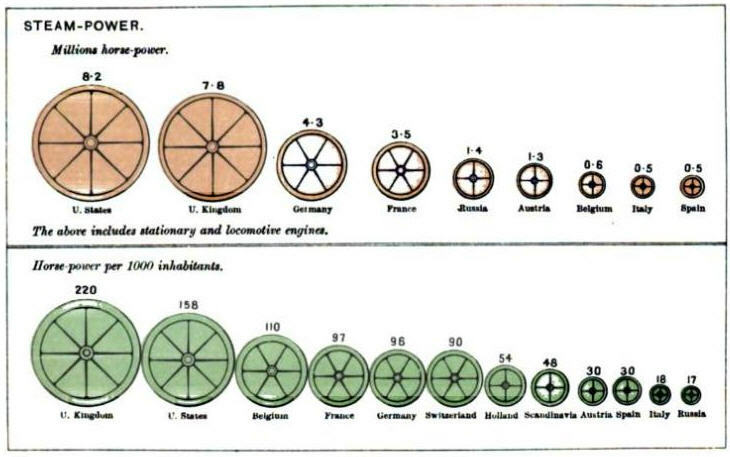 Loua used this as a graphic summary of 40 maps of Paris, each showing some feature of the population by arrondisement. 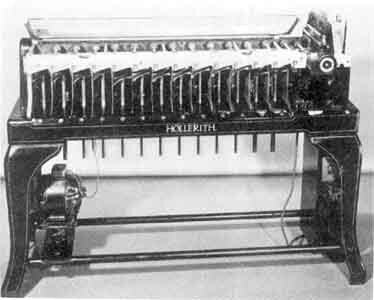 This device was later used by Bertin who also considered ways of reordering the rows and columns (the "reorderable matrix'') to make the pattern of high/low values more apparent. 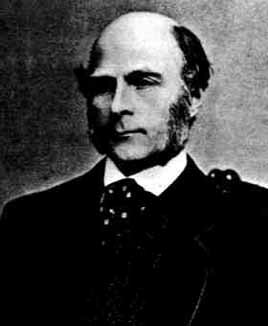 In 1875, Galton was interested in the inheritance of size in sweet-pea seeds, but appears to have tried with smaller seeds first, apparently that of cress. 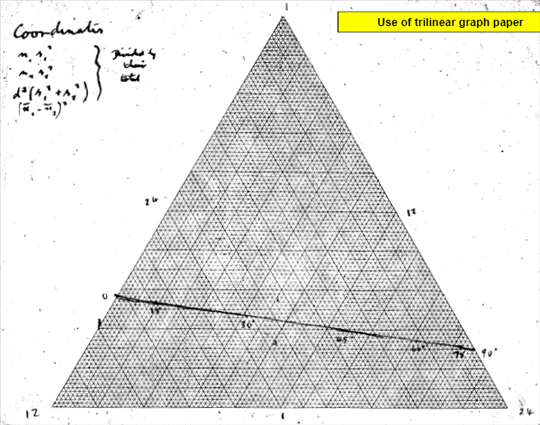 The isograms are represented by ink lines on the sheet of glass covering the little compartments which contain the ranked seeds of the daughter-plants. 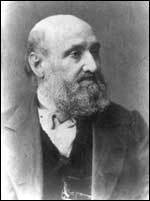 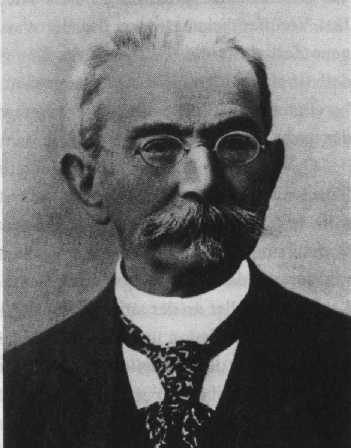 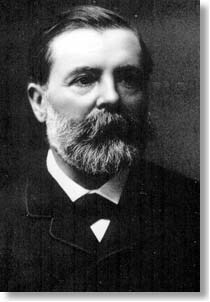 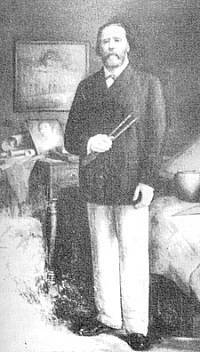 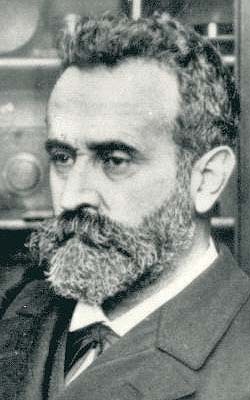 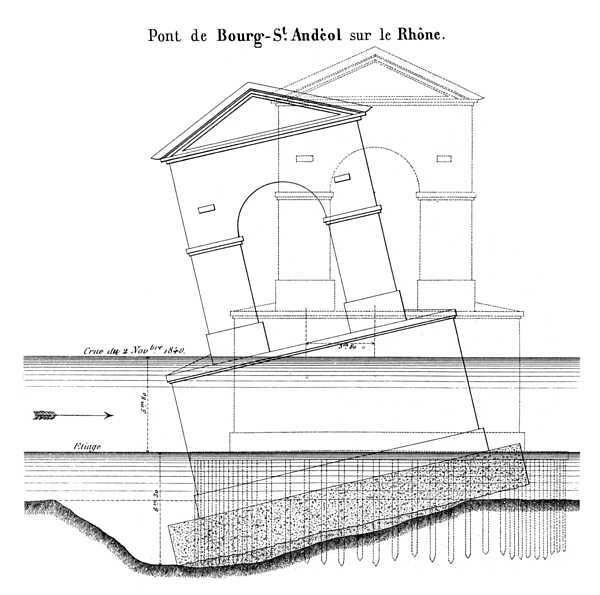 Lallemand was director of the "Service de nivellement de la France,'' designed to establish the heights of locations, water levels and tides throughout France, taking geodetic measurement to the third dimension. 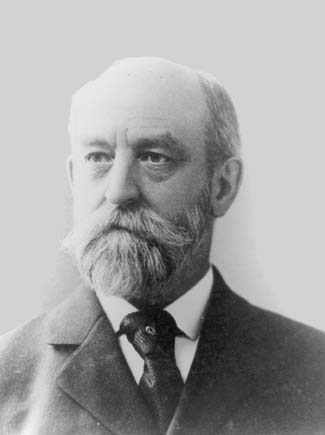 He also served as Inspector General of Mines. 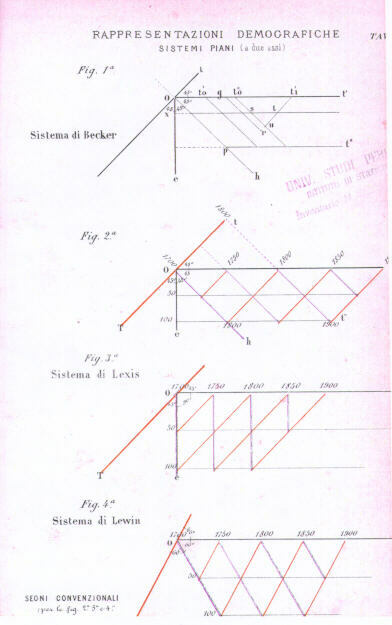 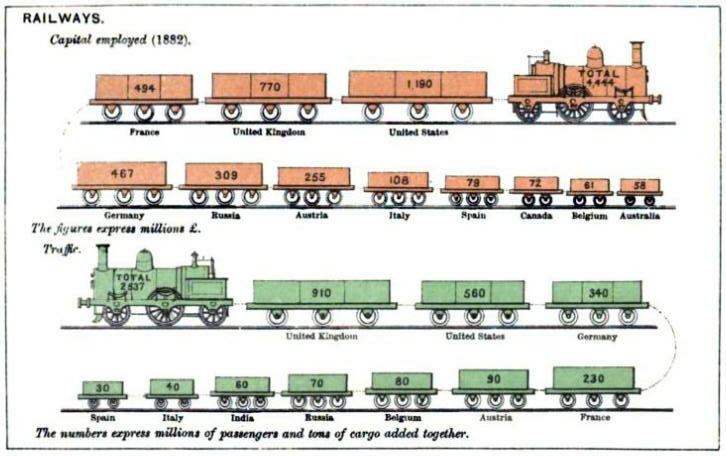 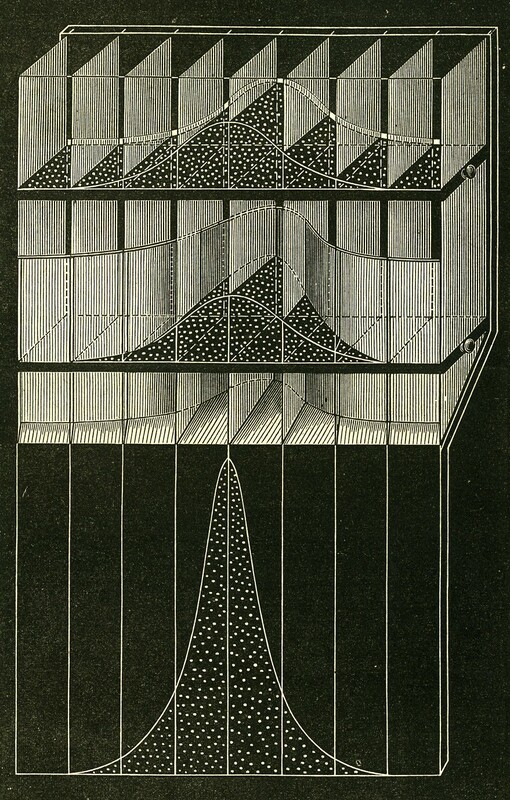 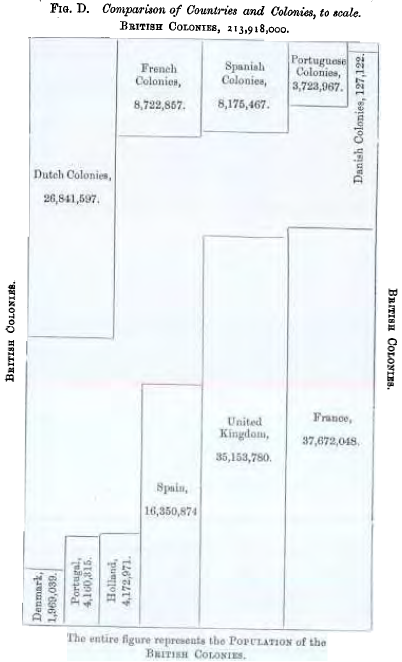 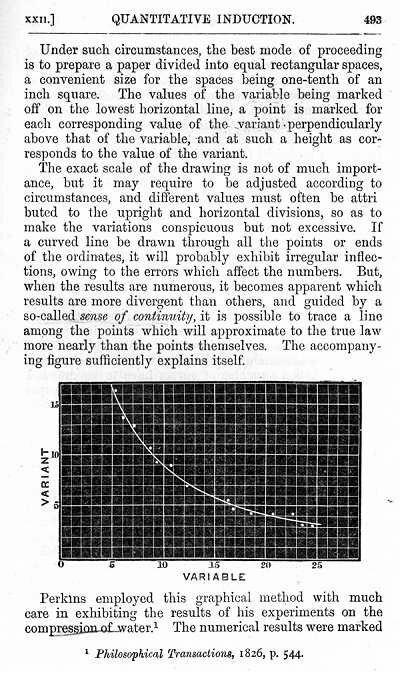 Diagrams with parallel axes had been used before, notably in the 1870 Statistical Atlas of the United States by Francis Walker. 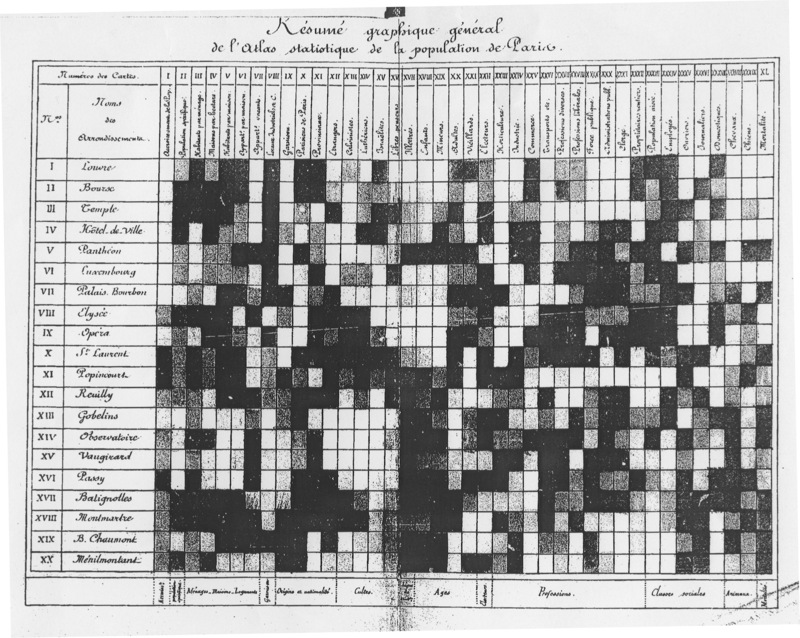 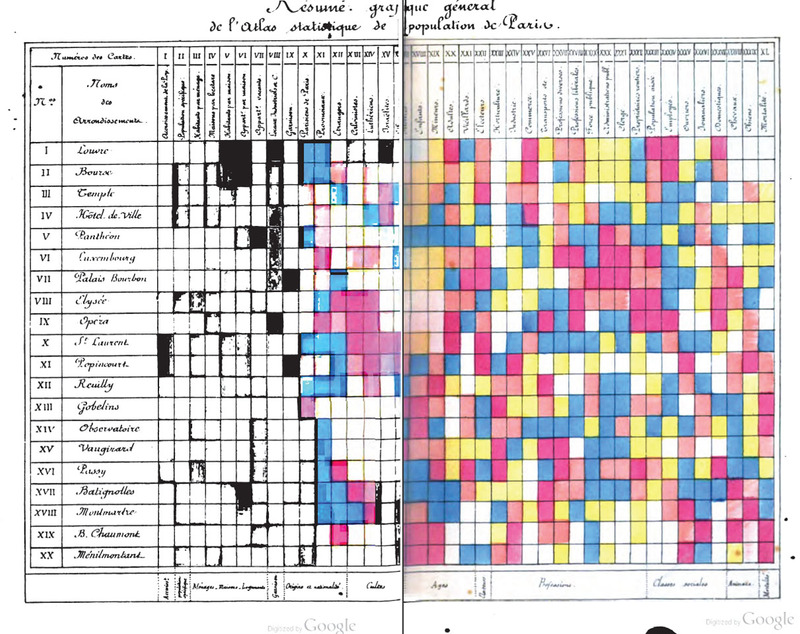 For example, Plate 97 shows mortality of different racial and national groups according to age and disease categories. 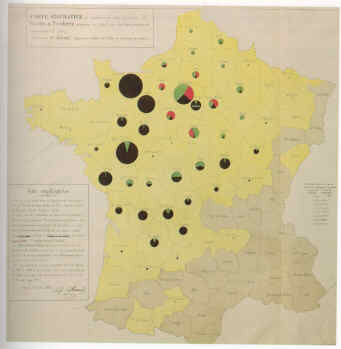 This web version is dedicated to Arthur H. Robinson (1915-2004), who inspired and encouraged our interest; to Antoine de Falguerolles, who initiated it, and to les Chevaliers des Album de Statistique Graphique, who supported it with interest, enthusiasm, and resources. 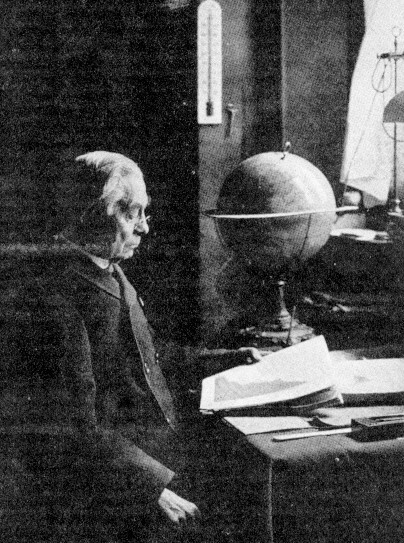 In particular, Gilles Palsky, Antoine de Falguerolles, Antony Unwin and Ruddy Ostermann contributed important images and background information. 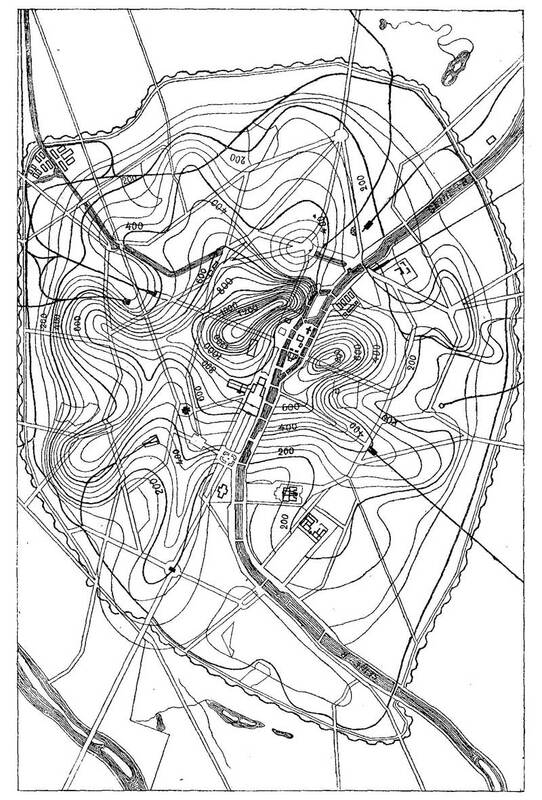 This work is supported by the National Sciences and Engineering Research Council of Canada, Grant OGP0138748.